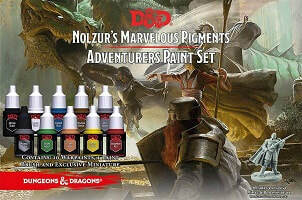 Nolzur's Marvelous Pigments: Adventurers Paint Set - The Army Painter are both excited and proud to produce the paints for the upcoming official Dungeons & Dragons line. These Gale Force 9 sets will finally - and for the first time ever - bring dedicated colours to the fantastic D&D universe! The Adventurers Paint Set Contains: 10 Warpaints, a Starter Brush and a miniature to get you started. 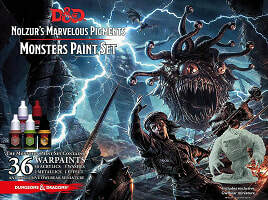 ​Nolzur's Marvelous Pigments: Monsters Paint Set - The Army Painter are both excited and proud to produce the paints for the upcoming official Dungeons & Dragons line. These Gale Force 9 sets will finally - and for the first time ever - bring dedicated colours to the fantastic D&D universe! The Monster Paint Set Contains: 30 Acrylic Paints, 3 Washes, 2 Metallic Paints, 1 Effects Paint, and a exclusive Owlbear Miniature. ​Nolzur's Marvelous Pigments: Brush Set - The Army Painter are both excited and proud to produce the paints for the upcoming official Dungeons & Dragons line. These Gale Force 9 sets will finally - and for the first time ever - bring dedicated colors to the fantastic D&D universe! The Brush Set Contains: 1 x Basecoat Brush, 1 x Detail Brush, and 1 x Dry Brush.